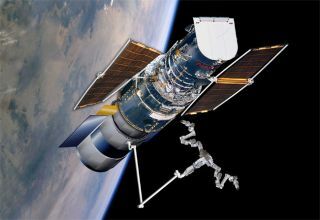 NASA has given the go-ahead to a Canadian firm to work on apossible robot-salvage mission to the Hubble Space Telescope (HST). Thecontract is valued at $154 million and builds on the space robotics work ofMacDonald, Dettwiler and Associates (MDA) Ltd through its MD Robotics group in Brampton, Ontario. The awarding of the HST contract work is a milestone in ago/no go decision due next summer when NASA will decide whether or not toproceed with the observatory's servicing by robotic means. The Canadian firm built the "Canadarm" -- the robotic armtechnology often used on space shuttle missions. In addition, undergovernment contract to the Canadian Space Agency, MD Robotics -- with the helpof a Canada-wide industrial team -- developed the robotic systems that representCanada'scontribution to the International Space Station (ISS). A MobileServicing System provides the ISS with sophisticated space-based robotics toassemble, transport, and maintain payloads in orbit, as well as help build andmaintain the space station itself. In a statement announcing the contract, MDA touted MD Robotics work for a prospectiveHubble repair mission as positioning the company "asthe world leader in extending human reach in hostile environments with greatprecision and reliability." Based on Canada'sspace robotics technology called Dextre, MDA will design a concept that couldsupport the repair and upgrade of the Hubble space telescope. That is, if NASAconducts such a mission. Dextre is the dual-armed robot built by MDA under contractto the Canadian Space Agency to conduct exterior maintenance of theInternational Space Station. That robot is specially designed to perform complex tasks inthe harsh environment of space, such as installing and removing batteries,power supplies, computer units, and scientific payloads. According to a statement from the Canadian Space Agency,Dextre will be adapted to replace batteries, gyroscopes, and perhaps aninstrument on the $1.5-billion scientific Hubble Space Telescope to extend itslife. The move to use robots to service the Hubble Space Telescoperather than spacewalking astronauts remains controversial. Outgoing NASA Administrator, Sean O'Keefe, has beensteadfast in his decision not to risk astronaut lives conducting such amission. O'Keefe cancelled Hubble servicing via space shuttle attendantsfollowing the loss of shuttle Columbiaand crew in early 2003. However, a study performed by a special blue ribbon panel ofthe U.S. National Research Council recommended to NASA last month that thespace agency should scrap plans to service the orbiting telescope robotically.The study group advised that a space shuttle crew could perform the work anddoing so was the best option available. Dan Friedmann, President and Chief Executive Officer of MDA,explained in a statement: "The Hubble mission and our strategic participationin other space missions will demonstrate that robots can cost-effectivelycomplete complex tasks in space, while working together with astronauts on theground." If given the final go-ahead, the robotic Hubble missionwould follow on the heels of two U.S. military satellite missionsthat will utilize MDA's solutions to perform similar tasks. According to the company, MDA is involved in two otherimportant unmanned U.S.military satellite missions. MDA recently shipped a space-based solution for aclassified satellite observation program, and is in the final stages of anotherpreviously announced key space servicing mission. A statement from Canadian Space Agency (CSA) explains that asuccessful robotic servicing mission could prolong Hubble's life expectancywell beyond 2010. Without such a mission, the space observatory could fail assoon as 2007. "Through the Government of Canada's long-standing commitmentand vision, we have earned a reputation for leadership and innovation in spacerobotics, an expertise that is second to none," added Marc Garneau, Presidentof the CSA. "NASA's recognition of the expertise of MDA is a source of pridefor all Canadians," he concluded.